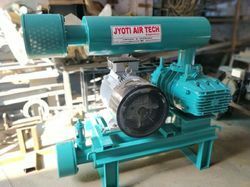 Prominent & Leading Manufacturer from Ahmedabad, we offer root blower, air cooled roots blower and twin lobe roots blower. Suitable for various gases such as air, town gas, Natural gas, nitrogen gas, carbon dioxide, inert gases. The special air filter is provided depending upon the application and working environment. These are positive displacement Twin lobe Air Compressor (Roots Blower) suitable for a wide range of operating speeds to meet the exact capacity requirements of the applications. They can be offered for pressure duty up to 10,000 mm wg and vacuum duty up to 6,000 mm WG. two stage machines can be offered for pressure up to 22,000 mm WG. 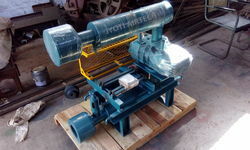 These machines can be used for compression or boost of vacuum gases. The working chamber consists of two parallel cylindrical bores containing two rotors, each with two lobes which counter rotate without touching with each other, or the casing. Heavy duty gears ensure that a correct clearance is maintained between the rotors. The working chamber requires no lubrication hence the medium handled does not get contaminated with oil. Our unmatched domain experience and in depth technological expertise has enabled us to manufacture and supply a huge assortment of Air Blowers such as TWIN LOBE ROOTS BLOWER that is designed to be used in effluent treatment plants as well as pneumatic conveying applications. We also offer additional accessories along with these. We manufacture these by using cutting edge technologies in our modern manufacturing facilities from the finest raw material components. Our clients are offered these in standard as well as customized specifications at affordable prices.